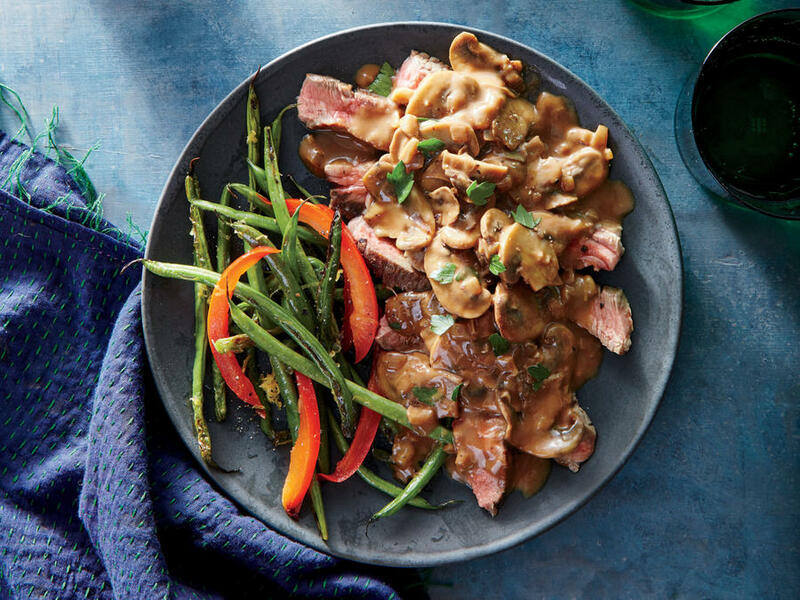 This dish was born in upscale American restaurants decades ago but couldn’t be easier to make at home for a perfect, and wonderfully retro, date-night supper. Dovetailing Tip: Buy an additional 8 oz. strip steak. Cook the steak, to desired doneness, with the others in step one. Let cool and refrigerate. This additional steak will be used for Meal 5, Garlic & Herb Steak Pizza. 1. Heat oil in a 10-inch cast-iron skillet over medium-high. Sprinkle steak with salt and pepper. Add steak to pan; cook 4 minutes on each side for medium-rare or until desired degree of doneness. Place steak on a cutting board; let stand 10 minutes. 2. Add mushrooms, shallots, and garlic to pan; cook 6 minutes or until mushrooms are browned. Add brandy; cook 1 minute or until liquid evaporates, stirring constantly. Stir in stock, mustard, and Worcestershire sauce; cook 2 minutes. Remove pan from heat; stir in half-and-half. 3. Cut steak across the grain into thin slices. Divide steak between 2 plates; top evenly with mushroom mixture and parsley.